Evelyn Van Orden's love of fiber arts began as a child when Grandma Gmeindl taught her to crochet and Aunt Jo Hackl taught her to do needlepoint and embroidery. She was bitten by the needlework bug and created many needlepoint pictures and pillows, Christmas ornaments made of felt and decorated with beads and sequins. In college, her friend and roommate Shelley Henderson got her started crocheting afghans, and soon she was crocheting and knitting sweaters. All of her closets became filled with patterns, yarn, crochet hooks, and knitting needles. In 1995, Evelyn starting taking quilting classes and bought her first sewing machine: a computerized Bernina 1630. 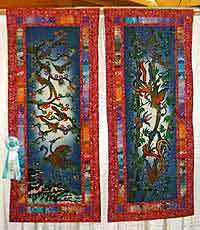 The quilt shown on the right, called Paradise of Birds Diptych: Cranes & Bamboo, was her first attempt at original design. This quilt won "Best Use of Embellishment" at Glendale Quilt Show 2000. Since 2003, Evelyn has been teaching a full curriculum of knitting and crochet classes at local yarn shops and yarn events in Southern California. She offers a unique approach to instruction, giving students the tools and training to not only master techniques, but also unleash their own creativity to create unique designs. Evelyn also designs and original knit and crochet patterns and sells them on her website evelynArts.com. Her designs have won over 20 ribbons at the Los Angeles County Fair, the largest county fair in the nation, culminating in a Best in Show in 2012 and an invitation to enter her designs in the California State Fair. 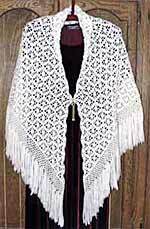 Evelyn is currently working on several books of knit and crochet patterns.